David Anderson was, in the early 2000s, a member of Democratic Socialists of America in Boulder Colorado.. 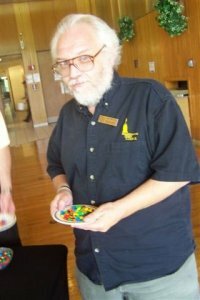 He is a retired Colorado University librarian. In 1980, a group of Western New American Movement supporters, including Dave Anderson of Boulder, issued a statement to the National Conference urging closer ties to the Socialist Party USA. David Anderson signed an April 2003 Statement on Cuba, initiated and circulated by prominent Democratic Socialists of America (DSA) member Leo Casey, calling for the lifting of trade sanctions against Cuba. In 2008 Dave Anderson, president of AFSCME Local 3592, member of DSA Democratic Socialists of America of Boulder, CO signed an online petition “A Open Letter to Barack Obama on Iran”. David Anderson played a significant role in Colorado, despite having no functioning DSA local at the time . He served as a precinct chair and on the steering committee of the local Progressive Democrats. They defeated two of three anti-labor initiatives that were on the ballot (including the first defeat of a right-to-work law since the 1970s) and expect the third to be struck down in court. “Maybe now we’re headed to a period where being a socialist publicly means more,” he comments. “Those big questions are being raised, like what do you do with the auto industry?”. In 2009 Dave Anderson was Colorado contact for Democratic Socialists of America. David Anderson Alliance for Retired Americans activist, Boulder. 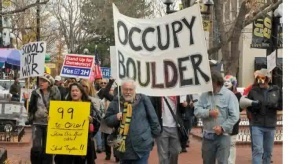 "I am getting involved in Occupy Boulder, which only got started last weekend. I spoke at the very first General Assembly. I got up to respond to a Ron Paul supporter then I proceeded to talk about DSA, democratic socialism, and the need for coalitions. Quite general. 10 or 15 minutes. Got a good response." This Sunday June 14 2015, from 3 to 5 pm...Leslie Lomas, David Anderson, and Karen Gruber would like to invite you to our Wine & Cheese & Snacks (of course, gluten free and vegan options available) Fundraising Extravaganza!! It's at Leslie's house -- call if you need directions. We will have Bernie Sanders information and merchandise available and will talk about the progress of the campaign and the election process here in Colorado. Bernie 2016: democratic socialism as an alternative to mainstream economics. Tracy Mott, Professor of Economics at the University of Denver, provides an economic analysis of democratic socialism and explains how alternative economic policies can reshape our economy so that it works for all Americans. For more information, please contact Denver-Boulder DSA Chair David Anderson. David Anderson pledged support for Bernie Sanders through Labor for Bernie, a "nationwide network of labor activists, backing Bernie Sanders' 2016 presidential campaign." Jack Hanley is a leader of Coloradans for Bernie, with David Anderson. David Anderson supported the Democratic Socialists of America Unity grouping, established for the 2017 Democratic Socialists of America National Convention in Chicago. In 2017, the Boulder Jacobin Reading Group was made up mainly of Boulder Democratic Socialists of America members. David Anderson was a member of the group. Members of the DSA National Climate & Environmental Justice Working Group closed FB page, as of April 26, 2018 included David Anderson. This page was last modified on 23 February 2019, at 04:00.